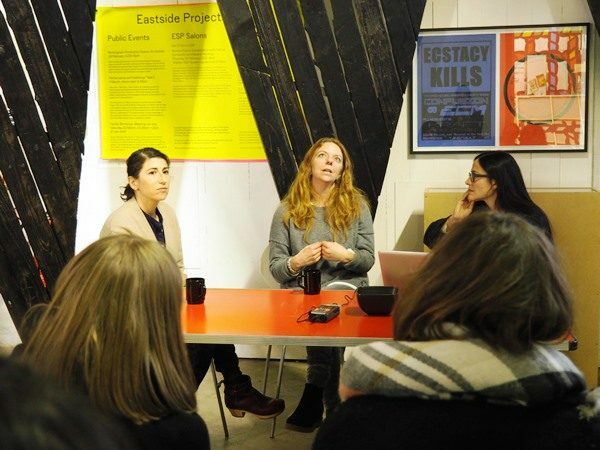 This artist talk saw a conversation between artist Amalia Pica, artist and Eastside Projects’ co-director Celine Condorelli and film director Havana Marking. Amalia Pica’s work, included in ‘Display Show’, Stage (as seen on Afghan Star) (2011) alludes to the Afghan television program for aspiring pop stars; for the audience voting for their favourites, the show offered a rare public forum for the expression of individual opinion. Pica reflects on how speech is a protected right in some regions of the world, while still a privilege in many others. In 2009 Havana Marking directed the documentary Afghan Star following four contestants in the Afghan TV music competition who became national celebrities. The film will be screened in Black Pleasure before the conversation and will offer a series of hints to reflect upon and discuss the work of Amalia Pica, as well as some of the political and social aspects implied in the process of staging and communicating in troubled environments. Amalia Pica lives and works in London. She received a BA from the Escuela Nacional de Bellas Artes P.P in Buenos Aires in 2003 and attended graduate school at the Rijksakademie van beeldende kunsten in Amsterdam. Pica has had solo exhibitions at Museo Tamayo, Mexico City, (2013) Kunst Halle Sankt Gallen (2012), Chisenhale Gallery (both 2011), and Malmo Konsthall (2010), to name a few. Her work has also been included in numerous group exhibitions such as Under the Same Sun at the Guggenheim Museum, The Ungovernables at the New Museum (2012), Silence at the Menil Collection (2012), ILLUMInations, the 54th Venice Biennale, (2010), Word Event at the Kunsthalle Basel (2008), and Drawing Typologies at the Stedelijk Museum (2007). Havana Marking is a British producer and director of documentary films. Afghan Star is Havana Marking’s first feature documentary, shot over the 4 months in Kabul. She has produced TV docs (both factual entertainment and one-off polemics) for over 10 years now, although directing is relatively new to her: before AS she directed The Crippendales (2007)– a 30min film about the first troupe of disabled strippers winning the Channel 4@Sheffield scheme for New Talent. In 2005 she made the Great Relativity Show, a series of animated shorts (3MW) that explained the Theory of Relativity. These won a Pirelli Science award. While she was producing, she worked on some of the most successful UK formats and films: The F Word, Michael Palin: Himalaya, River Cottage, No Going Back, War On Terra – What Would Jesus Drive?